Two classic Australian Ford Falcons almost a decade apart. Each one a classic in it’s own right that highlight a legendary driver and an equally legendary race. 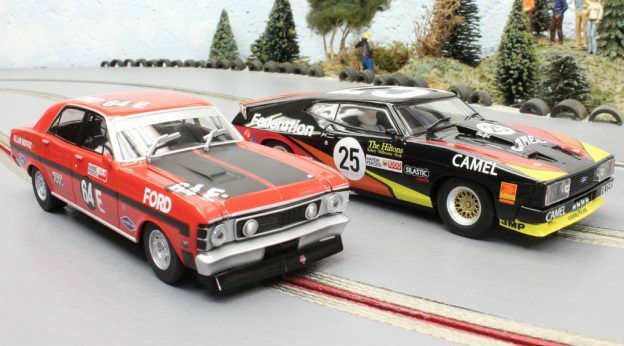 If you are a slot racer in Australia, you should be pretty excited at the release of both. I’m pretty excited and I am in the middle of the good old USA. Why the appeal? I am certainly no expert on Australian motorsports. The again I’m no expert on quite a few series our hobby features. But I do enjoy reading and learning about the many different race classes from all over the world. And recently that is just what I have been doing. The racing at Bathurst in particular, with the interesting history of Ford along the way. Read about it HERE. Now you might look at these cars and scratch your head. They don’t look like any Ford you remember. But if you sit back and research Ford in Australia, it will all make sense. Fascinating to me and you might find it creates a little more appeal for models such as this. To be very blunt, these models hold more interest than other various marques from Europe. Even with the steering wheel on the “wrong” side, they have very close ties with our own versions. Then you throw in the fast paced action that Bathurst featured and you get a win-win. This entry was posted in Product Reviews on July 3, 2017 by admin.